Kids Mural! This image featuring the giant HEY APATHY! public artwork and the friends of Breczy Park was included in the following article regarding raising children in Toronto. 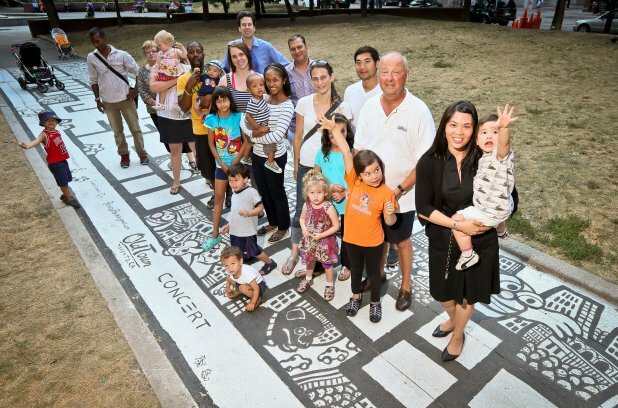 Sybil Wa, right, and her three kids Mei, 10, Clara 6 1/2, and Ivy 2 1/2 are joined by friends and and families in Berczy Park where the Friends of Berczy Park recently raised money to hire Toronto Artist Mike Parsons to paint this kid-friendly mural. Is Downtown Toronto a bad place to raise a family? Sybil Wa doesn’t think so. That’s what the mother of three, who lives near Yonge St. and The Esplanade, said following Deputy Mayor Doug Holyday’s comments that downtown isn’t a suitable place to live with children. Holyday, a former Etobicoke mayor who lives doors down from his grandchildren on a “very quiet” suburban street, made the remarks as he argued against forcing a condo developer to include family-friendly three-bedroom units in a proposed 47-storey building at King St. W. and John St.
“Where will these children play — on King St.?” Holyday asked. But Wa, who lives in a condo with her husband, Adam Parkin, and children, who are 10, 6 and 2, said raising kids downtown is safe and convenient. Wa was integral in instigating the new Kids mural in Berczy. “I see mostly benefits, which is why I’m here,” she said, standing in the shade of a park near Spadina Ave. and Adelaide St.
Wa is part of a generation of young families choosing to live downtown and take advantage of its amenities. Some 40 other families are doing the same in her building alone. Their reasons vary from sustainability to accessibility of cultural activities, but Wa said they all want many of the same things: improved city policies that take into account the growing population of families like themselves. She called Holyday’s comments provocative. To jeers from other councillors, Holyday said: “As far as raising your children downtown, maybe some people wish to do that. I think most people wouldn’t. Having families live downtown “just makes for a healthier city,” Lintern added. Holyday, whose proposal to eliminate the 10 per cent requirement was defeated 27-4, was unrepentant in later comments to reporters. “There are healthier places to raise children,” he said. The debate was the latest example of the stark divide between the right-leaning suburban councillors who populate Mayor Rob Ford’s administration and the left-leaning downtown councillors who serve as the de facto opposition. Maxime Béland, who strolled along the lakefront to the beach Thursday with son Xavier, 5, moved from Montreal to a condo at Queens Quay and Yonge St. about two years ago. “We wanted to try the condo life. We’ve never been very good at cutting the grass or shovelling the snow,” he said. Xavier plays soccer at Cherry Beach every week. But his dad cautions him against bouncing a ball near their lakefront condo to prevent it rolling in the street. The family enjoys great pizza, street festivals, a ROM membership, swimming in the condo pool and playing at the gym. “We can cross the street, jump in the ferry and be on the island in 30 minutes,” said Béland. Kids should be able to grow up and live their full life in the city, said Wa, adding that families are setting roots downtown. Wa has out-of-town friends who come in for special events, but rarely go to the free night at the art gallery because it isn’t walking distance from home. “I mean, my kids have participated in Nuit Blanche since they were (young) because it’s so easy,” she said. City policies and planning have yet to catch up with this lifestyle, Wa said. This article with the kids mural photograph appeared in the printed and online editions of the Toronto Star and the Metro.